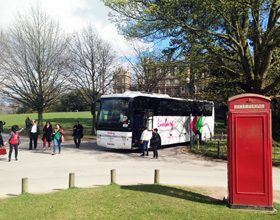 With decades of experience, Linburg is a leading bus and coach hire operator based in Sheffield, South Yorkshire and Derby, Derbyshire offering a comprehensive local and national coach hire service. Whether your coach hire requirement is to transport conference delegates from the airport, concert-goers to a festival or club members to the coast, Linburg Coach Travel has a package for you! Linburg Coach Travel recognises that it is only as good as the people who drive and organise your coach hire. Our team of skilled professionals are committed to ensuring all your coach hire expectations are fulfilled. Call 0114 2619172/01332 554823 or e-mail: info@linburg.co.uk us today to see how our coach hire service can provide effective solutions for your coach hire needs.